One of the greatest testimonies to Indian textiles is the deep commitment it solicits in others. Carole Douglas has dedicated many years of her life to honouring the craft traditions of Kutch – a remote desert area of NW India and sharing a border with Pakistan. For Douglas, her involvement with textiles and the arts in general goes beyond an aesthetic appreciation. It’s part of a lifelong vocation for community development and environmental advocacy. Her early career in New Zealand balanced her own personal creativity with commitment to education and social development. A move to rural northland in the 1970s saw her running the art department of a small district high school, establishing a textile studio and working with the (then) department of Maori affairs on issues of youth unemployment. In 1982 she won the first fibre arts award when the NZ Academy of Fine Arts accepted textiles as an arts genre and several architectural scale commissions followed. In the same year she was appointed Crafts Coordinator for the Northland Community College and worked with small Maori communities on product development and marketing. In 1984 Carole was elected vice-President of the Crafts Council of New Zealand – a role she carried out until her move to Sydney in 1986. The move, due to her husband’s work, was a disruption to an established career but with a long-term positive outcome. At first, she felt like ‘a small fish in a big pond’. The Australian education system did not recognise her years of experience and consequently she did not resume teaching and, dissatisfied with synthetic dyes, she also put her textile career ‘on hold’. Instead she turned her hand to design and writing, began teaching herself computer graphics on a Mac Plus (1987) and by 1991 had written, illustrated and published Earth Alert,an environmental awareness book for children. In recognition of this and for her advocacy and activism at grass roots level she was nominated as environmental citizen of the year and attended the Earth Summit in Rio de Janeiro (1992). The focus on sustainability continued to expand. In 1995 Carole graduated with a Masters in Social Ecology from the University of Western Sydney, established a business, Green Gauge, and worked as a consultant, community educator and trainer for clients ranging from Commonwealth to local government, industry, schools and community groups. Under this banner she developed and managed education projects for AusAid, NSW Health Department, Clean Up Australia, Sydney Olympics, NSW Waste Boards and the EPA amongst many others. Working towards this, she began travelling regularly to Kachchh – slowly building contacts and a business strategy. This however was changed abruptly in 2001 when, just six days before she was due to leave on a trip, news of the earthquake came through. Knowing she could not travel as planned she turned to her community and with the support of the Mayor, Cr Jean Hay, she held a town meeting, formed a committee and a not for profit organisation – ’Art to ‘Art – to gather funds for earthquake affected artisans. 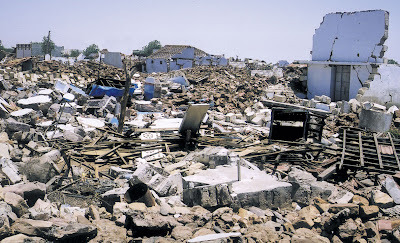 In 1993 the project culminated in the opening of the exhibition Resurgence – stories of an earthquake and survivalat the Manly Art Gallery and Museum, Sydney. In the intervening two years Douglas visited Kachchh on four occasions and for extended periods of time. There she set up a local group consisting of NGOs and individual artisans, established guidelines and protocols and invited artisan participation. During the process the project assumed its own shape and by opening night the gallery was filled with a range of dyed, printed, woven, painted, felted and stitched works that told artisans’ stories of survival and of their aspirations for the future. A new narrative form was launched. 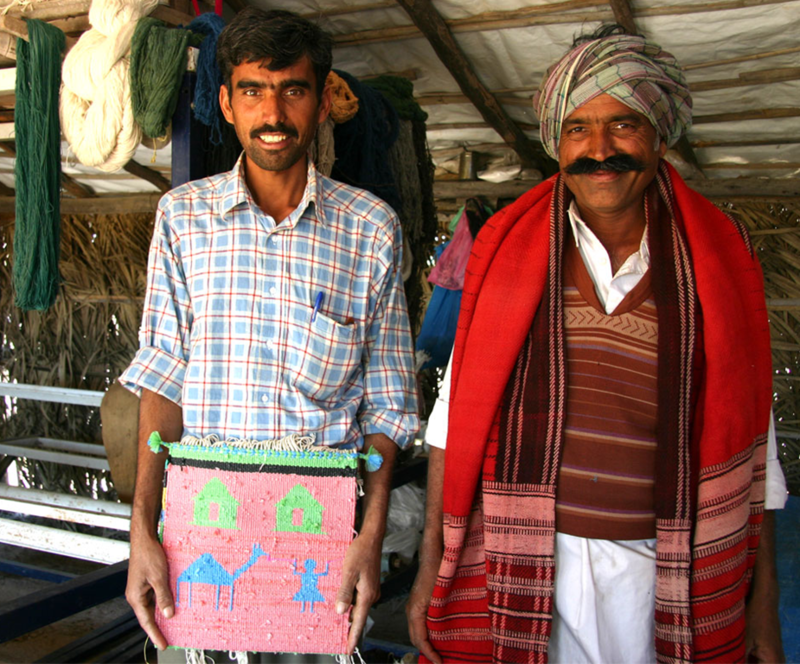 Thanks to the Australia India Council and Fibre Forum five artisans were able to attend the show, participate in public education days and then went on to teach at a local textile conference. After its run in Manly the widely acclaimed show returned to India, was shown in Ahmedabad at the Nehru Foundation for Development and at the Chhatrapati Shivaji Maharaj Vastu Sangrahalaya (formerly Prince of Wales Museum) in Mumbai to strong response. Artisans, who were paid an artist’s fee in Australia, were then remunerated again when the collection was acquired by the CSMVS in 2005. During these years, Carole phased out of her Australian-based work and focused on Kachchh and in 2004 began taking tours, which she now averages at two per year. In 2006 she was approached by the Nehru Foundation to design and curate an exhibition for the 4th UNESCO Education for Sustainability Conference, 2007. Working with the younger generation of Kachchh artisans and with the assistance of the NGO Khamir and the Centre for Environmental Education, she developed a project which ran workshops on sustainability for Kachch artisans, a workshop on translating those ideas into textile works and setting the guidelines which underpinned the works. These guidelines required artisans to take account of materials and processes, costs, time and environmental and social impacts and to consider these when making the works – a gentle introduction in to life cycle analysis. ‘New Voices, New Futures’ was a conference highlight and was later acquired by Khamir where it is displayed all, or in part, at their Kachchh resource centre and is lent out to interested parties. 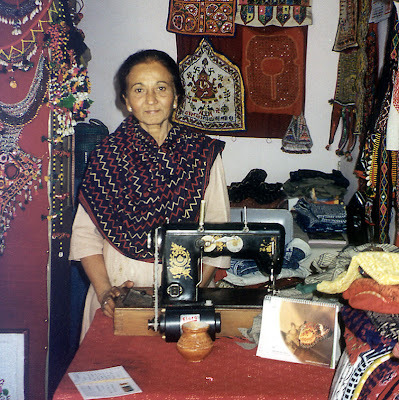 The broad aim for Douglas is to maintain tradition in the face of change and to see it as evolutionary and not static: ‘There is great dignity amongst traditional artisans and it is tradition that sustains them.’ She is keen to develop foreign markets but is aware of the trials and tribulations in this process. She is presently working with Ross Longmuir at Planet Furniture on a range of rugs adapted from their traditional form into runners but without the traditional ‘fringed’ ends. ‘I had to sit with the weaver for hours figuring out how to create something as basic as a flat end.’ They have achieved this finally and now they all wait for market response. 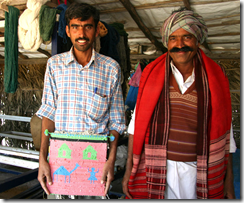 Douglas also works with artisans to help them understand the economy of export. The Internet has made a fairly transparent market place which has its disadvantages for entrepreneurs. She recalls working with the V&A shop when she was commissioned to produce a range of hand embroidered scarves. On one trip to Kachchh she was approached by someone who asked her for a loan; the item had been seen on a web site and word had spread that the scarves were selling for 200 pounds, five times what the artisan was paid. Douglas went to great lengths to explain some basic rules of export. The mark-ups along the way and the risks incurred along the supply chain are not commonly understood. The only person not at risk was the artisan who was paid a deposit at commencement and the balance on completion. Transparency of pricing is a common issue in product development, but it is not easily accepted without a much deeper understanding of economics and capital. In reflecting on what she’s learnt from this process, Douglas admits that she has changed expectations. This involves not taking ‘Yes’ to a delivery time literally and knowing that saying ‘No’ is not part of a culture that sees time on a continuum vastly different from our own. She is also clear about a pricing structure which values handwork, the integrity of tradition and human dignity. ‘All too often I am asked to reduce prices. How can I do this without reducing the quality of the work or for that matter, human life?’ she asks. An intrepid traveller, Carole has also spent periods of time with the shepherding communities of Kachchh. ‘There is nothing like being with herders and their animals, drinking freshly brewed camel, goat, or buffalo milk chai out in the open or being with the women in their temporary shelters which they create with such a sense of place and out of so little’. As a reflection on her own journey and these experiences she has created an exhibition using sound, images and found objects at the Manly Art Gallery & Museum. ‘Markers for the Journey’ opens on Aril 27th and runs until June 3rd. 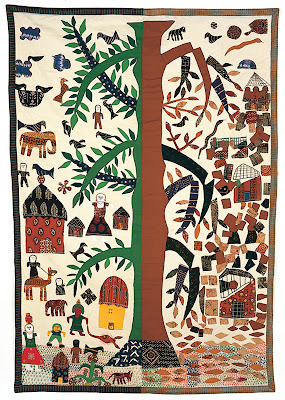 Carole Douglas’ engagement with Indian craft is part of a lifelong dedication to the continuance of cultural tradition, framed in the broader interest in caring for a common planet. There is also an article about Carole in Craft Unbound. In my childhood, my grandfather would dress up as Santa Claus, we had a fully fledged tree and Christmas dinner (it was usually lunch) with all the trimmings. We were not wealthy. My parents were creative. Gifts were generally handmade; dolls clothes for me and wooden toys for my brother. According to a family legend I went ‘missing’ one Christmas day afternoon. I was 3 years old. My lovingly made gifts lay discarded on the back steps and I was nowhere to be found. I was finally located sitting under the taupata hedge (a favourite hiding place) playing with a handful of rusty nails in a rusty tin can. I have no recollection of this or of what the game might have been. Today, I find myself placing several handfuls of rusty nails in a bucket along with water, jaggery and besan flour. I am fermenting the makings of black dye and as I ‘play’ with the nails collected in Kutch I remember the Christmas story! In between these two points in my life I have been known to seek out the perfect substance for turning cotton black; from Naphtols (before the world knew better) to Vat to Fibre Reactives I played the field, none was perfect and I moved along sans black! Only much later did I go to India and lo and behold there I found the perfect black. Was it rusty nails that set my direction? Who knows. All I know is the ‘irony’ of the story.